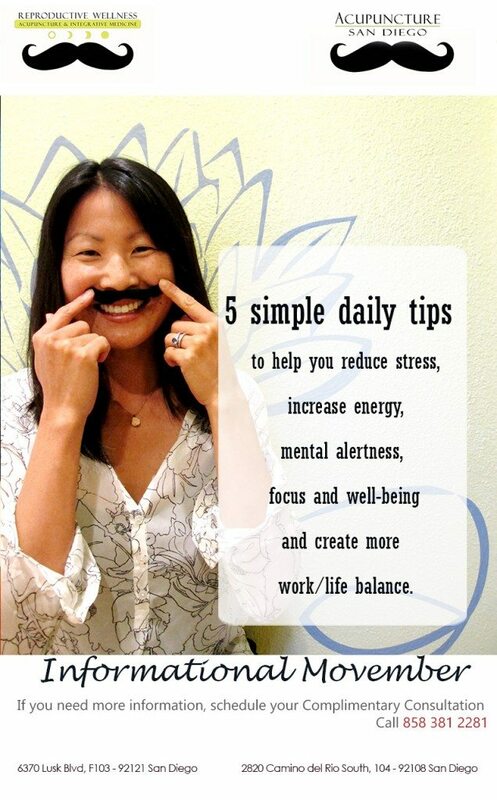 5 simple daily tips to help you reduce stress, increase energy, mental alertness, focus and well-being, and create more work/life balance. As a modern man, do you find yourself overwhelmed by more work than you feel you can get done in a day? Are you feeling stressed by job-strain brought on by long hours at the office yet not enough time to get all your work done? Do you have a desire to be more productive at work while maintaining involvement with your loved ones and friends? This month of Movember honors men and is an opportunity to make time for yourself and focus on your own personal health. Here are 5 simple, daily tips to help you reduce stress, increase energy, mental alertness, focus and well-being, and create more work/life balance. 1. Diaphragmatic Breathing: Start and end each day–or take a few minutes at work–with some deep abdominal breathing. Before getting out of bed each morning, try breathing in through your nose for a count of 8 allowing your abdomen to fully expand–hold for a count of two–and breathe out through your mouth for a count of 8 allowing your abdomen to fully deflate. Health Benefit: Encourages the relaxation response which is a healthier way of responding to daily challenges such as money woes, relationship problems, job worries, and traffic jams. We often respond to these seemingly “emergency situations” with the “fight or flight” or stress response, which increases blood pressure and suppresses our immune system. Shallow breathing also limits the diaphragm’s range of motion so that the lowest part of the lungs doesn’t get a full share of oxygenated air that can make you feel short of breath and anxious (http://www.health.harvard.edu). 2. Take time out to do a pleasurable activity! Health Benefit: Whether you like to garden, go for a sail, woodwork, play a game of hoops, go for a hike or go dancing, doing activities that you love has been shown to promote greater health and feelings of happiness, reduce feelings of stress, and create a sense of work/life balance. Fact: The New England Journal of Medicine reported on the effects of recreational activities on mental acuity in aging. Of notable interest, dancing frequently led to a 76% risk reduction for dementia! Benefits: Walking, especially done outdoors, will put you in touch with nature and will increase your energy. A 30-minute walk each day will help you to maintain a healthy weight, lower blood pressure and even make you live longer (American Heart Association). It relieves stress and helps to improve relaxation and focus. Other benefits include: giving you a chance to connect with a loved one, friend or co-worker, or providing much-needed quiet time during your busy work- day. Mindfulness is about paying attention. Try sitting and breathing and paying attention to your body and immediate surroundings instead of all of the cluttering thoughts in your mind. Notice things that are real i.e., your hand, this chair, that bird’s chirp and then the abstract thoughts about what has happened that day or what may happen have less hold. Doing this allows the mind to rest (www.menshealth.com). Health Benefits: Among its many benefits, meditation appears to help the heart and head. The NIH funded a study review that noted a 30 percent decrease in cardiovascular mortality among meditators. With short amounts of practice, 2 months, changes in brain function were associated with changes in behavior such as decreased anxiety and increased well-being (www.menshealth.com). Lie on your back and place your legs up a wall so that your body forms an “L” shape with your hips comfortably close to the wall and yet with the intention of keeping your leg muscles relaxed. This pose has been suggested by Roger Cole, Ph.D., a certified Iyengar yoga teacher and sleep research scientist in Del Mar, CA. Health Benefit: This pose helps send blood back to your trunk that has been stuck in your legs. It increases blood circulation and helps waste products to be cleansed by the liver and other organs and will help you to feel more energized the next morning.